This print is an OPEN EDITION. This classic gallery-style matted and framed print is part of a special collection of our most-loved prints. It is matted with a black-core white mat and framed in stained ash wood with lightweight and shatterproof plexiglass protection. Published exclusively by Eyes On Walls. Artist Info: Lora Zombie is a self-taught painter from Russia and a top seller on the urban art scene. With a unique commentary on pop culture and keen eye for beauty, her raw and grungy trademark style is unmistakable. Only in her early twenties, Lora has already gained a massive following of fans across the globe and held major exhibitions in New York, Los Angeles, Toronto and St. Petersburg. 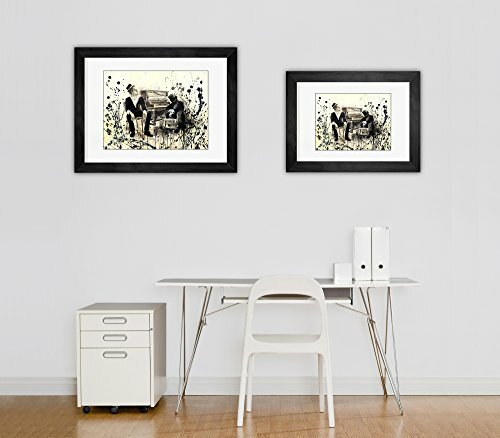 This high quality fine art print is matted with a black-cored white mat and framed in black ash wood. Ready-to-hang - comes with an easy to use hanging kit. Published exclusively by Eyes On Walls.